An ageing web server and website software that wasn't being updated by their previous developer was causing frequent crashes when their ~30000 seasonal player base used the site. 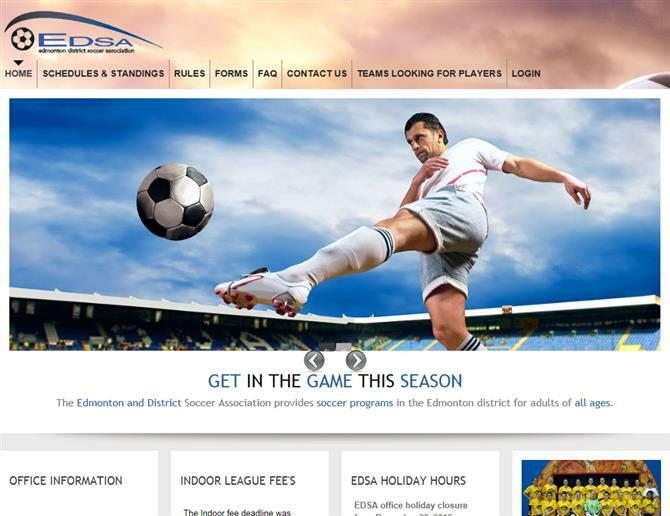 We pulled out the functionality and all the years of player/game data from Edmonton District Soccer Association - EDSA's original database, added new functionalities and fixed some old problems. On the player/coach side of the website we made a user friendly and responsive (desktop through to mobile sizing) view for schedules and standings. We included the team jerseys with two colours and short colours on schedules so players know which set of gear they should bring to each game and dynamic google maps that tell them where the game is. Coaches can assemble their team online before the season begins and submit it for approval to EDSA. Player transfers, blackout requests and team affiliations are also started by coaches on the coach only pages. Administrators are able to manage their player base, allocate players to teams, assign teams to divisions and automatically schedule entire divisions in a season with the click of a button. If the player scores a goal or requires discipline for a red card, the administrator enters the game card and the system tracks the goals and penalties. When a player's suspension from play is completed, the system sends the player and their coaches/managers an email notifying them that they are eligible for play again. In order to support scheduling of games during the season, we've included an excel document import which validates the incoming information, grabs all the fields/times/field qualities and breaks them up into playable availabilities. The system prioritises the best field qualities first and the highest divisions are scheduled into those availabilities first. We were also able to remove Adobe Flash, which is being phased out web wide, for camera capture and profile pictures for user records, helping to make the new EDSA website just a bit more future proof!